More ‘Whoville’ Trees, Patterns & Parcels. To add to yesterday’s new collection of quirky trees, here are some more fun trees, plus some wrapped presents for underneath the tree! To compliment these graphics, there is also a set of bold spotted, dotted and striped printable papers in reds and greens. High resolution 12×12 inch papers to decorate all your Christmas projects. Pop over to my ETSY store to see them and all my other ranges of Christmas graphics now! New on Etsy by customer request is as set of quirky Christmas graphics. Inspired by The Grinch by Dr. Seuss, these Whoville-style trees can be used for all your Christmas crafting projects. There are 11 different patterned tree graphics in shades of red and green with an assortment of polka-dot, stripe and spot patterns, many topped with Christmas stars. You can use them for creating Christmas cards, Christmas party decorations, invites, scrapbook pages and much more! Look out for some more quirky and whimsical Christmas themed vector graphics and some matching patterned papers, COMING SOON! The five lucky winners of the Creative Stamping Issue 47 giveaway have been announced. Each of the lucky winners wins the Sarah Paris ‘Wedding Celebration’ digi stamp & graphics bundle, containing a selection of stamps, graphics, papers and sentiments from my wedding celebration range. If you weren’t lucky enough to win one of these freebies, check out the full range in my Etsy Store! And as an extra treat, there’s currently 30% off in my Super SALE! Would you believe how many magazines I’ve now featured in! I didn’t realise there were so many! 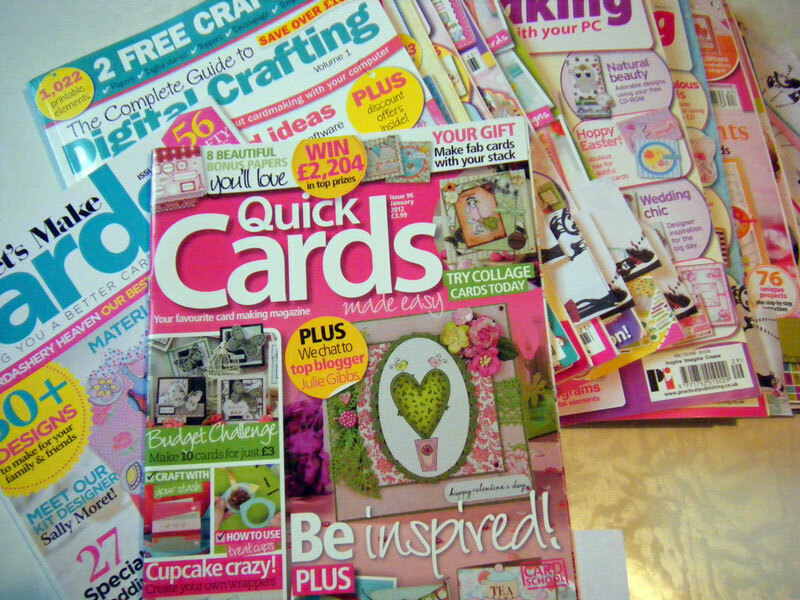 In all these magazines I’ve given away lovely freebies and there have been tutorials on how to make a variety of cards, the possibilities for fabulous designs are endless. If you’ve enjoyed any of the freebies, why not take a look at the gorgeous digital designs available for purchase and immediate download in my shop and treat yourself to some digital crafting goodies that you won’t find anywhere else except in my Etsy store. 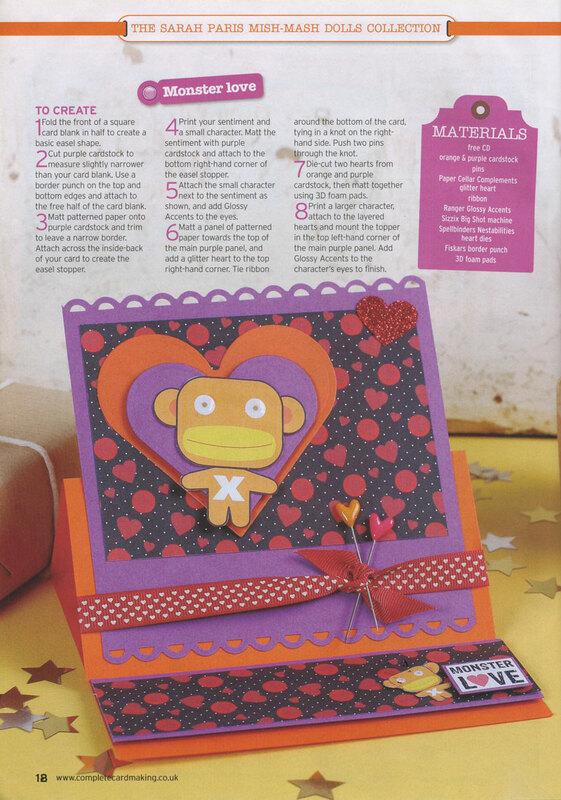 Here’s a look back at a previous feature from Issue 33 of Complete Cardmaking to give you some inspiration for your winter/Christmas designs. I was lucky enough to have my Festive Flakes collection included on the cover CD along with the following feature, showcasing some gorgeous card designs by myself and the talented Lisa over at PaperCraftBliss. This issue is now unfortunately completely sold out, but you can still purchase all the designs and much more to download in my Etsy store. 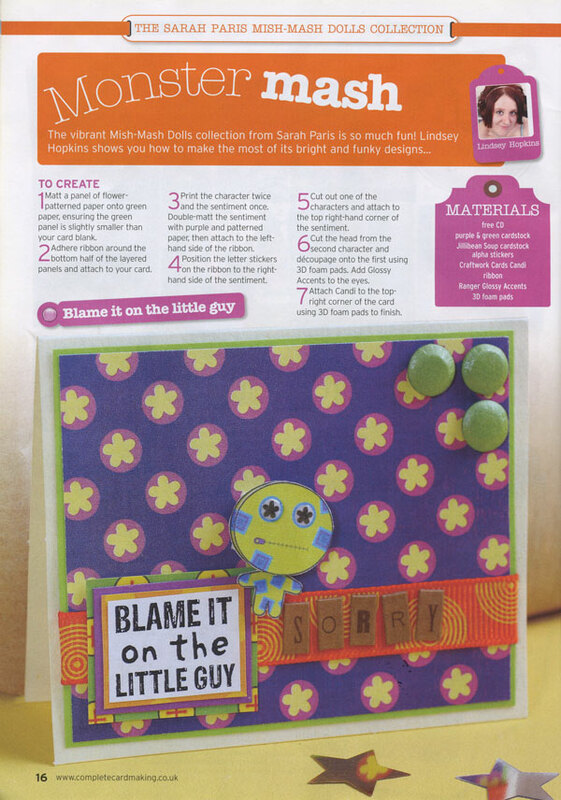 August/September 2012 feature in Scrapbook Magazine with Sarah Paris Floral Sonata Cover Gift. This issue is now SOLD OUT! A full set of printable files to accompany this feature are available for sale from my online shop. Thanks to everyone at Practical Publishing for their help in putting together this fabulous issue. I hope you all enjoy it as much as I enjoyed designing it for you! 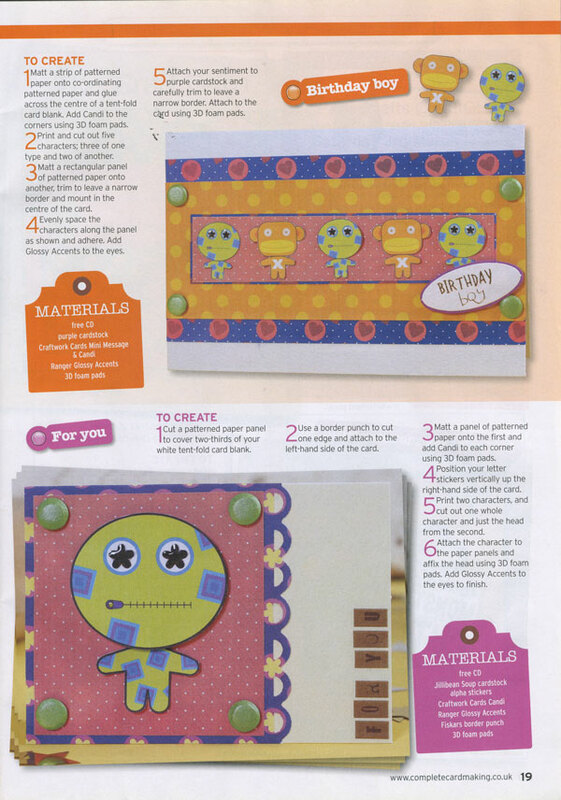 Feature from Issue 35 of Complete Cardmaking Magazine – 8 fabulous cards to make using the “Mish Mash Dolls” collection included on the free cover CD. This issue is now out of stock but the clipart and free digi papers, plus digi stamps are all available in my Etsy shop. It’s lovely when the magazine readers take the time to write in in praise of your work. 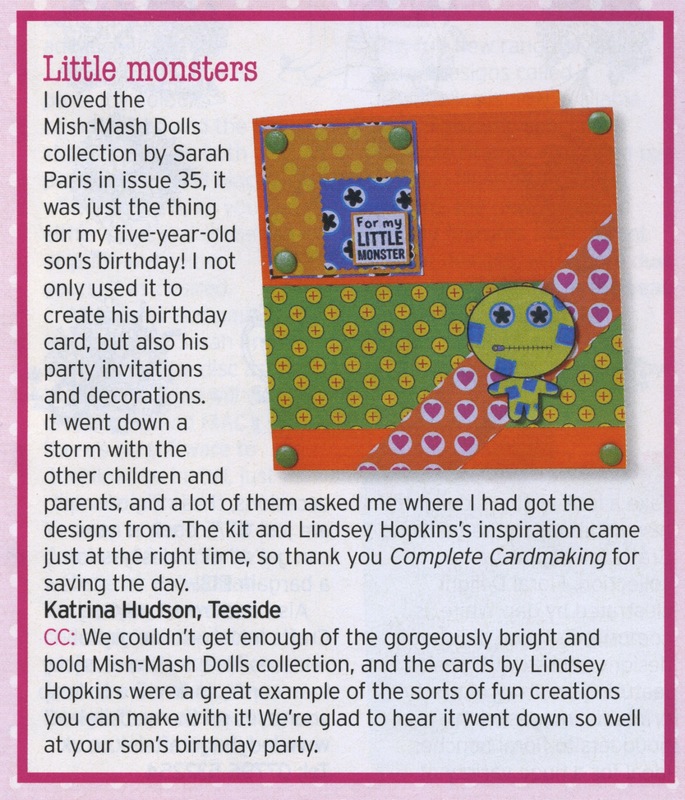 Here’s a little customer feedback on my Mish-Mash Monsters contribution to issue 35 of Complete Cardmaking. 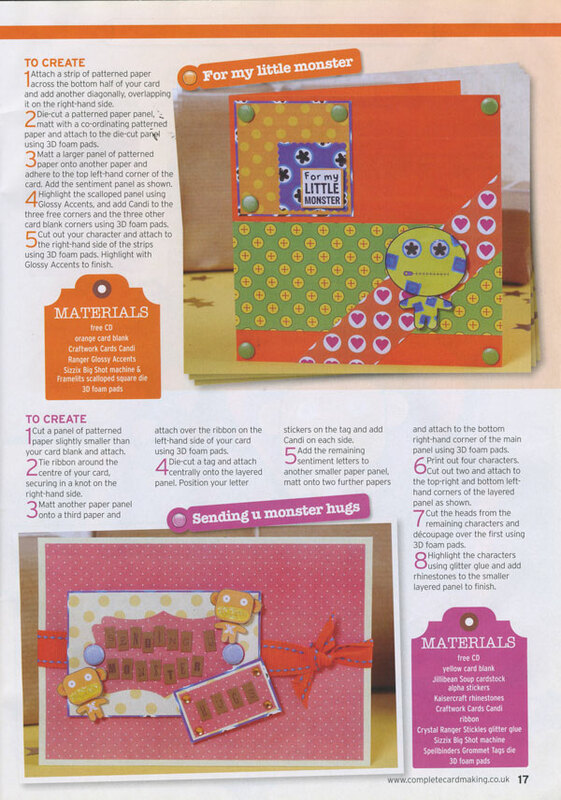 Look out for a Sarah Paris giveaway in issue 47 of Creative Stamping magazine, on sale from 17th August. You’ll have the chance to win one of 5 sets of Sarah Paris graphics, digi papers, digi stamps and sentiments, selected from the Celebration range, worth approx. £7.50. If you can’t wait until then, pop over to my Etsy store where a more comprehensive selection of graphics, papers and stamps are available right now. 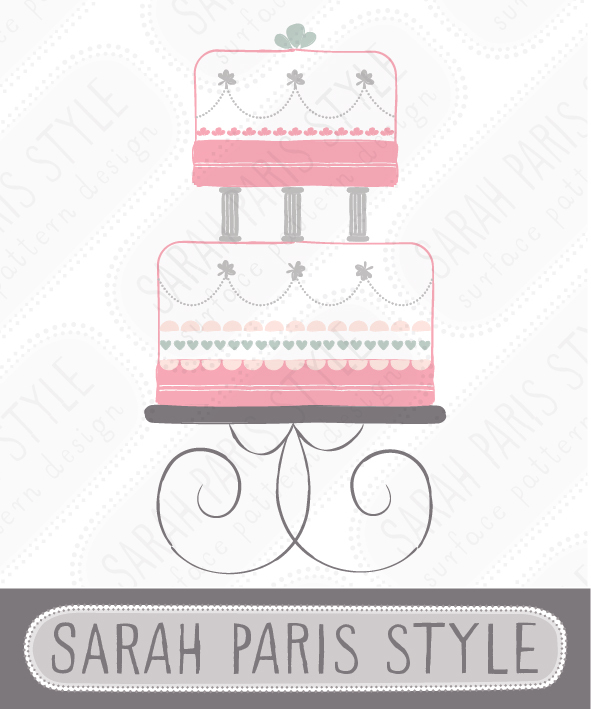 Sarah Paris graphics can be used for handmade cards, scrapbooking and other craft applications. These fabulous celebration cakes would also be great for custom logos and branding. The possibilities are endless. Finally, I’ve managed to put some cute new designs on Etsy – and there’s more exciting news, as they’re going to be featured in an upcoming issue of Papercraft Essentials! 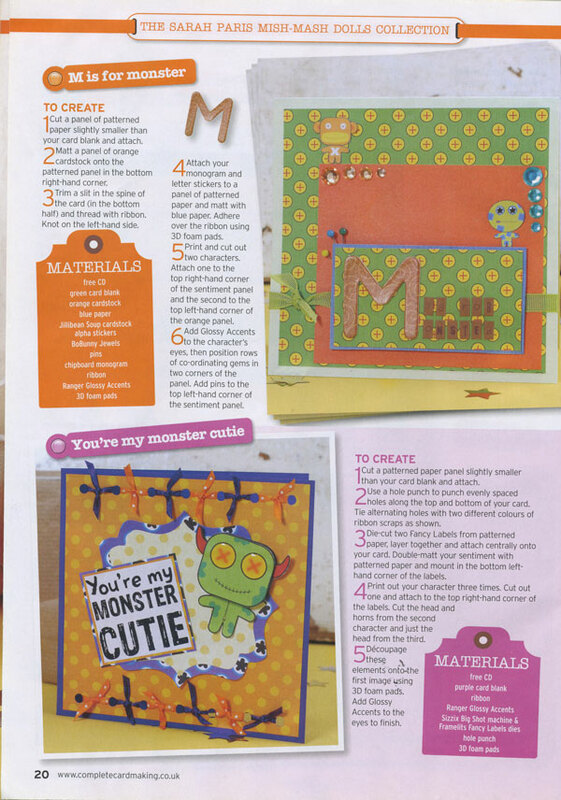 These Cool Kitty designs are going to be in the Cut Out and Keep section of issue 128, on sale on 17th December! There will be a four page section devoted to the cards made with this collection of graphics, papers and digi stamps and I can’t wait to see it! Meanwhile take a look over on Etsy in my shop and you’ll find all 3 new sets there. Or click on the images below to take you straight to them now.